Here's a medical curiosity: how many people would recognize this cast as that belonging to a child with TB? It was found in the attic of one Swansea family and Linda Delve rang me wondering what to do with it. It belonged to her aunt Margaret Scott who was in Craig-y-nos as a toddler in the early 1940s. She was sent home as a five year old with the plaster cast and told to sleep in it every night. Her aunt has since died. TB was rife in the Welsh valleys and many children spent years lying motionless in such contraptions. 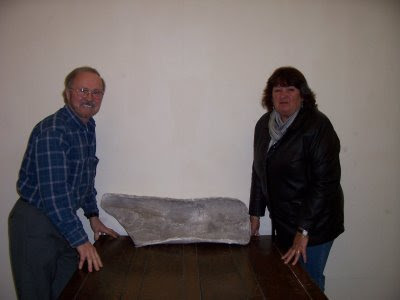 Meanwhile, if you come to our book launch on Friday, May 1st, at Craig-y-nos Castle you will be able to see the plaster cast for it will be on display for a day.